Admissions in the M.Phil and PhD degree programs are currently being offered by the University of Karachi (UOK) and for this, all the interested students have been directed to apply for their desired program now. The last announced date for submitting the registration forms is 28th April, 2019 after which an entrance exam will take place on 15th May whole the result will be declared upon 23rd May. The University of Karachi was established in 1953 which makes it one of the oldest institutes if higher learning in the country. Having performed extremely well in multi-disciplines like medical research, social sciences and sciences & technology, the university has gained a lot of recognition not only in Pakistan but has also attracted a large number of international students. UOK is now not only among the Higher Education Commission of Pakistan (HEC) top ranked institutes but also has a really impressive rank among the world’s top universities. 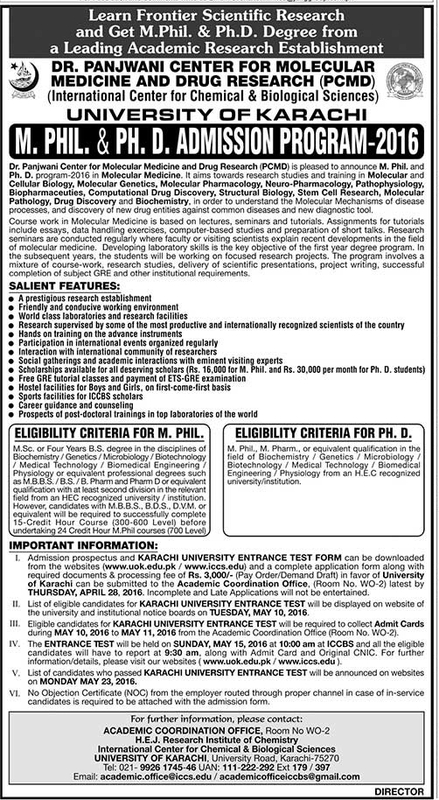 A certain eligibility criteria related to previous education has been set by the University of Karachi (UOK) for admission in these M.Phil and PhD degree programs which can be checked in detail through the official university advertisement given on this page. Prior to applying for admission, read the eligibility requirements carefully and do make sure that you fulfill them completely, as without doing so no applicant will be granted admission under any circumstances. Once you have reviewed the eligibility criteria and think that you meet all the requirements then the next step is to submit your registration form. The admission prospectus and the entry test form both can be download online from the official website of the university. The duly filled form along with all required documents must be submitted to the authorized department till 28th April. After the completion of registration procedure, all received forms will be reviewed after which a list of eligible candidates will be issued on 10th May. The written entrance test is scheduled to take place on 15th May, 2017 at 10:00 while the list of candidates who passed the Karachi University entrance exam will be announced on 23rd May through the official website of UOK.